Schooltime was a little hectic this week for Zachary. We had our routine thrown off a little bit by a trip to the doctor's office - so not as much time to focus on preschool as much that day - and then crammed more into another. 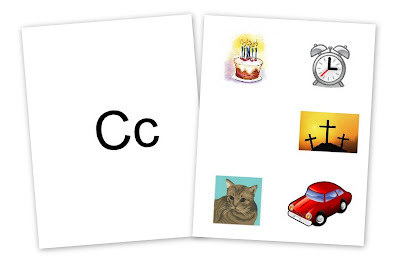 We talked about the letter "C" this week and that involved crickets. The girls found themselves a cricket, named it "Chirpy" and everyone was having fun playing with him. Until Kaleb stomped on him. I seriously laughed out loud - the looks on the other three's faces was just priceless. I'm not a mean mommy - it was just so funny. The alphabet book page for the letter "C" was a Clock (sorry, I know the scan didn't turn out that great!). We used a rectangle base and Zachary colored it to look like a clock (not one in oru house - he didn't feel like using brown). 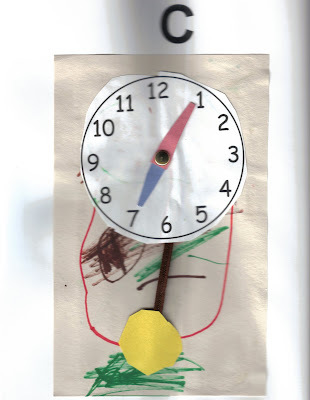 He cut out a clock face that I printed off and we added some hands with a brad so that the hands can move around. There is also a little pendulum hanging (just a circle taped onto half a pipe cleaner). We used paint to mix primary colors (red, yellow and blue) to see what colors we could make when we mixed them. We played Candyland together - what can I say? We are also using some little workbooks by Kumon called "Let's Cut Paper" to work on Zachary's cutting skills (there is a link on the Amazon widget below). Calendar: We've been working on patterns using our wall calendar, getting the days of the week down pat and also the months of the year. Zachary is thinking he is such big stuff too! Learning by singing is a huge help in our house and the Sounds Like Fun cd from Discovery Toys has some great songs on it for learning your days of the week and months of the year (among other things). Cotton Ball Counting: Glue correct number of cotton balls onto a sheet of paper next to the number that is written down. Colossians 3:20 - "Children, obey your parents in all things, for this is pleasing to the Lord." This week we used our Handwriting Without Tears worksheet to practice our letter "C" (the link will take you to the Scribd site where I uploaded the one I made). I love what you are doing with the letters of the alphabet and am heavily borrowing your ideas in my esl preschool classes in Japan.